I’m not in the habit of posting all the PR tips that I get, especially after so many others before me have already featured the same thing. 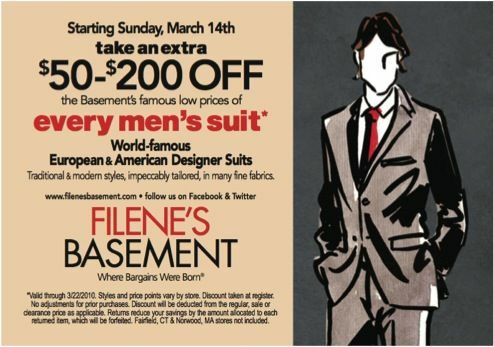 However, I will pass along this one, simply because one of my favourite suits came from a Filene’s Basment sale in Washington D.C. . It is a glen plaid, three piece flannel Freedberg originally destined for Barney’s. I couldn’t have touched it, except at Filene’s. A hundred dollars in alterations later, it is just about perfect. “A hundred dollars!” you say. All told, the suit cost me less than USD$250 and some fifteen years later I still feel like a million bucks in it. Know your size, know your tastes, know a good alterations tailor and know that you’re bound to find something no matter where you look. Now you’re in the know. This entry was posted in Elegantology and tagged Filene's basement, Freedberg, Glen Plaid. Bookmark the permalink. Chris, you know exactly what you are looking for! Perfect!! I feel honored. I’m never in the know. About anything.